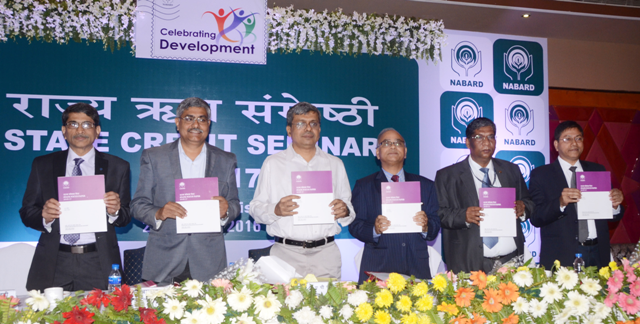 The State Focus Paper ( SFP) on priority sector credit potential in Odisha during 2016-17 have been released by Chief Secretary Sri Aditya Prasad Padhi in the State Credit Seminar organized under the aegis of National Bank for Agriculture & Rural Development ( NABARD) in Bhubaneswar on Thursday. Addressing the Seminar as Chief Guest, Sri Padhi urged upon the banks to achieve substantial increase in credit flow to agricultural sector during 2016-17. Chief Secretary also emphasized on extension of banking and credit advance facility at all Panchayat head quarters by opening of new brick and mortar branches or other service extension models. Sri Padhi emphasized that real financial inclusion cannot be achieved without having banking facilities at gram panchayat level. He urged upon the banks to ensure 100% implementation of the subsidy and incentive based schemes announced by Govt in agriculture and allied sectors. Addressing the Seminar as guest of honor, Development Commissioner and Additional Chief Secretary Finance Sri R. Balakrishnan said that the basic agenda of the Govt is faster poverty reduction which can be achieved by enhancing the household level income. Govt have put in place a number of progressive schemes and programmes the success of which need adequate and timely credit flow. He advised the banks to take up these schemes and programmes more actively in the coming year. The SFP for 2016-17 presents a comprehensive picture of the credit potential estimated in various sectors of rural economy. It reflects the Potential Credit Plans (PLP) prepared by NABARD for all districts in the State. The document also contains the constraints and issues pertaining to various sectors along with suggestive measures for improving the credit flow and catering to the critical gaps in rural development. The paper has envisaged a projected priority sector credit potential of Rs. 58,882.39 cr for 2016-17 which is around 23.3% more than that of 2015-16. In the year 2015-16 the potential credit plan was around Rs.47, 756 cr. It may be pertinent here to mention that in a recent notification RBI has now included 8 sectors like agriculture, MSME, export credit, education, housing, renewable energy, social infrastructure and other allied sectors under priority sector lending for commercial banks. The total credit potential under agriculture for 2016-17 is projected at Rs.32, 207.90 cr which is around 54.7% of the total priority sector credit. The agriculture credit includes the farm credit (Rs.29, 710.95 cr. ), agriculture infrastructure (Rs. 1,494.38 Cr) and ancillary activities ( Rs. 1,002. 57 cr). Credit potential for MS&ME sector has been assessed at Rs.13,337.62 cr constituting 22.6 % of the total priority sector. The credit for sectors like export credit, education, housing, renewable energy, social infrastructure and others have been assessed at Rs. 13336.87 which is around 22.7% of the total credit potential under priority sector. The dignitaries namely Sri P.K. Jena Regional Director, RBI, Sri B V G Reddy Chief General Manager, State Bank of India, Sri B. P. Samantaray Convener, State Level Bank Coordination Committee addressed the seminar as special invitees. The General Manger, NABARD Sri M. Soren gave the welcome address and Chief General Manager NABARD, Sri S.K. Kale presented the key note address. The senior officers from concerned Govt departments, representatives from various commercial and cooperative banks, regional rural banks, Development Managers of NABARD from various districts along with thematic experts from academic institutions participated in the seminar.